Is it just me, or was this new moon a doozy? I felt super strange these past few days, during the new moon in Aries. I know everyone talks about how the full moon makes us crazy— but now I’m pretty convinced that the new moon may be just as impactful. I’d be tempted to say it’s just me, but a dear friend pretty much described EXACTLY how I was feeling— dissociative and numb. (Cool cool cool). One note about emotions and moon phases. Of course I don’t know exactly that the moon phase was causing my weird mood. But I also don’t think that it matters in a literal sense. One reason I love working with the moon is that it shows us that everything is cyclical. Everything ebbs and flows, and everything changes. So it becomes a lot easier to hold a weird mood for a few days, because I know that, like the moon, it will wax and wane. My energy will increase, then come back down, and all over again. Such is life. And learning this is a big step for someone who likes to pretend she has total emotional control of her life (#me). My boyfriend asked me the other day why I love witches so much. Of course there are countless reasons, but one of the main ones is this: to be a witch is to live in tune with nature. To make meaning from nature’s rhythms. To live as a part of the natural cycles of the tides, the celestial orbs, the seasons. Witches, pagans, and other earth-centered spiritualities see us not as separate from these things but as inhabiting the same natural realm. We ebb, we flow. We’re happy, we’re sad. We expand, we contract. Nothing is permanent; I know my current feeling-state will change, just like the moon does, just like the seasons. So, were my friend and I having similar emotions due to the fiery Aries new moon? Maybe. Did we just happen to be having a similar emotional experience this week? Maybe. Does it matter? Not to me. What matters to me is that watching the moon gives me a framework in which to experience my emotion. If I experience exhaustion and frustration during the new moon, I can ask myself: what is happening in my life right now to make me feel this way? What seeds can I plant in order to change how I feel? The new moon is traditionally a time of intention-setting; what are my intentions? How do I want to feel two weeks from now, when the moon is full? Watching the moon phases thus becomes a way to tell time, and to situate ourselves in time. Anyway, all these EMOTIONZ made me a bit late on posting for this new moon. But I feel the energy sticks around for a few days (shocker: it’s not an exact science). A moon phase is a gradual change, after all. 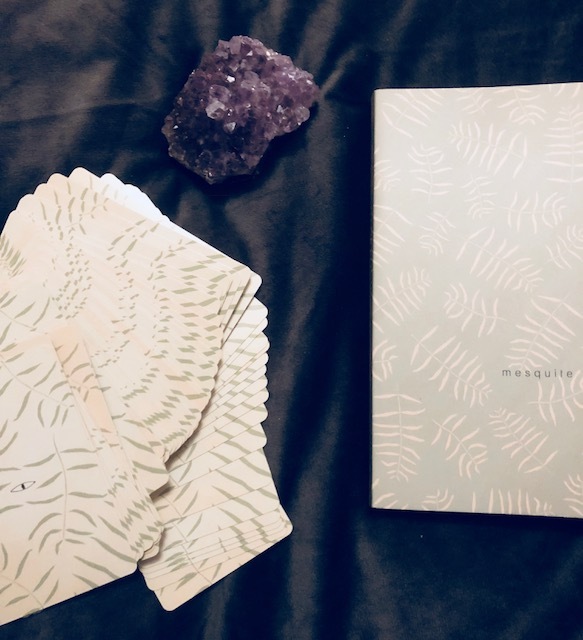 When I did sit down last night to pull a new moon card, I had the pleasure of pulling from my sweet new Mesquite Tarot deck (which I posted about on my Tarot wish list here). This is a delightful, simple, elegant deck that has a gentle energy. It also comes with a guidebook that is fantastic; both poetic and truly insightful. The card I pulled was the six of wands. The first word that often comes to mind for this card is “glory”. It’s a public success card; a recognition of some kind. A victory, a prize, a publication; something in that vein. Because of this, this card is often a double-edged sword. On the one hand, success is wonderful, and this card can represent a much-deserved success and recognition. On the other hand, this card sometimes means we’re putting too much emphasis on external validation; on what others will think of us, or how others define success. This card offers the perfect opportunity, then, to ask ourselves how we define success. What does living a successful life mean to you? Maybe it’s financial wealth. Maybe it’s social-emotional wealth. Maybe it’s freedom/independence/being self-employed. Personally, I want all of those, but I’ll prioritize certain ones over the others. I also highly recommend you play Ariana Grande’s “Successful” as you ponder this. Moving on. This card also invites us to ask whether we’ve received enough recognition for our work. Last night, when I pulled this card, that’s the aspect that jumped out at me: the recognition/appreciation aspect. I realized I’ve been working so hard and feeling under-valued (which also is just par for the course of working in the service industry). I realized that’s partly where my frustration is coming from: working so hard and feeling like I have little to show for it. Of course, I can’t pay myself more money (I wish), and no one else can make me feel totally recognized, but I can give myself the acknowledgement of how hard I’ve been working. So I wrote a little note to myself just validating how hard I’ve been working. And it felt nice! If you’re craving more recognition for all the work you do, start by giving it to yourself. After all, it’s most empowering to give ourselves what we need, rather than waiting around for someone else to do it (spoiler alert: they won’t). Another important aspect of this card is that it’s a six. It’s pretty much in the middle of the journey (each suit goes from ace to ten). This means that, though we may experience a success or point of recognition/validation, the story does not end here. It’s not enough to rest and stay here. There is more to do, more to accomplish. This is a victory but not the final victory. Take a moment to appreciate yourself and what you’ve accomplished, but then it will be time to keep moving. Wands are fiery, and Aries is a fiery sign. Make use of these fiery energies if you’ve been feeling stuck, like I have. At their core, wands are about passion. What is it that lights you up? What do you feel passionate about? Sometimes I feel like I get lost in all the things I’m working on and trying to do. When I get lost like that, I have to return to the seed of it all; the central passion, the reason why I’m doing all this. Otherwise, it’s just meaningless action. 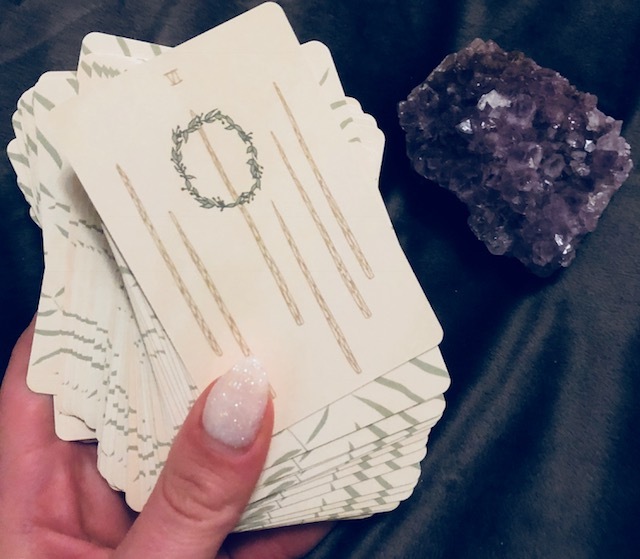 So, for this new moon, now beginning to wax, think about what success means to you. Validate yourself for all the work you’ve put in. Get in touch with the passion that drives you. In two weeks’ time, at the full moon, where would you like to be? How would you like to feel? What seeds will you manifest now, that may come to fruition then or later?